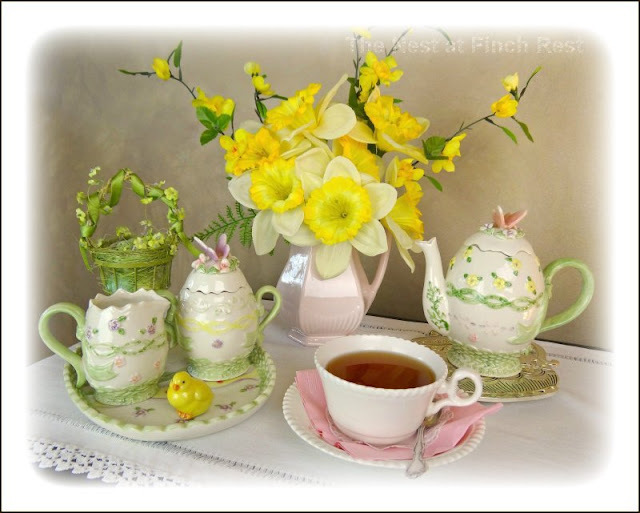 A whimsical little Easter tea for one today. Set out on the old wooden tea cart. The egg shaped teapot, creamer, milk jug and egg tray all wanted to join in the Easter fun! Even the butterflies joined in, appreciating the warmth of the Spring and the flowers blooming everywhere! 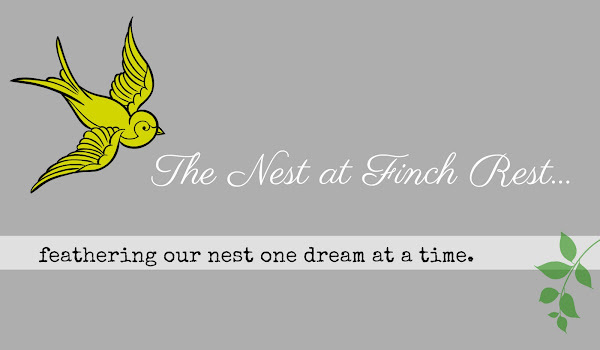 "Peep, peep, I'll fly over and get the scones!" 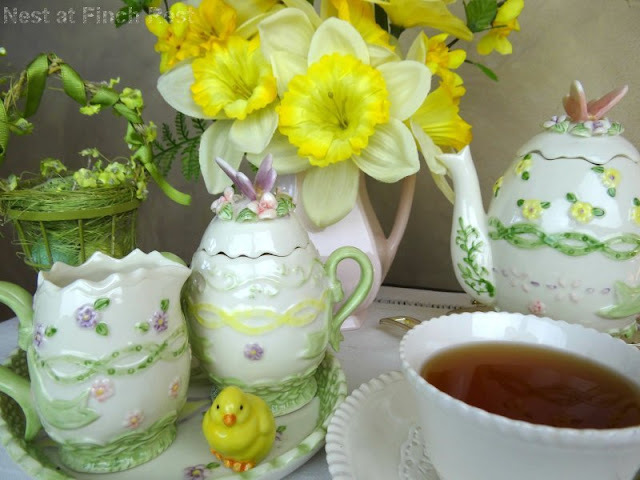 for an Easter Tea/Tea Time Tuesday Link Party! How charming! Sometimes we need to do things for "one". How beautiful! 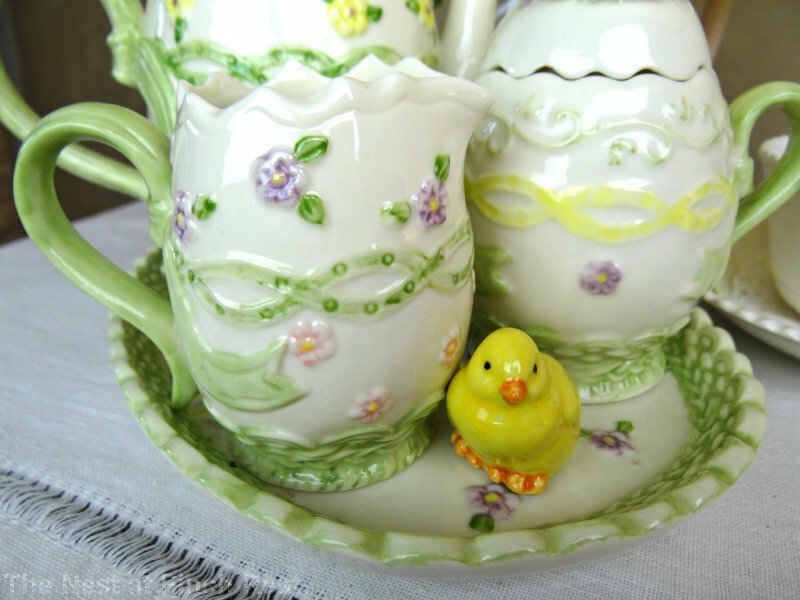 What adorable and cheerful tea things you have for spring and Easter! Wishing you a wonderful spring and joyous Easter! What a beautiful tea set! I enjoyed your little tea for one today. 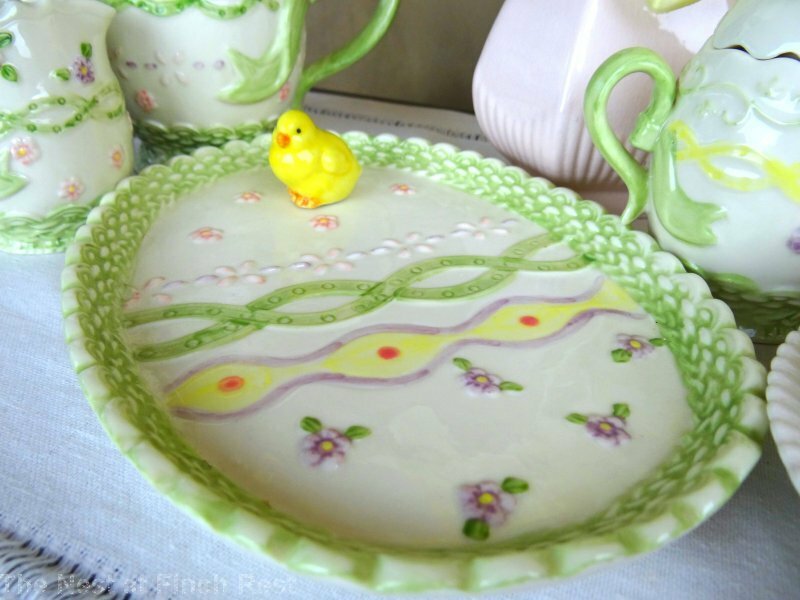 You have some darling Easter Tea dishes. Love the tea set. 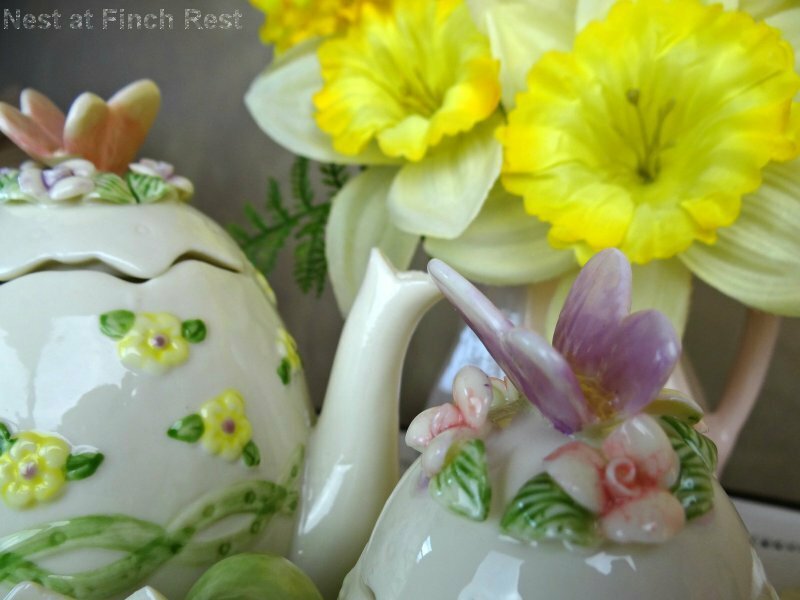 I love your Easter tea set-so pretty! What a cute little set, Michele! Perfect for a tea for one! What a wonderful tea. I love the tea set-so pretty. How beautiful. I love a pretty tea all set up this way. You have such wonderful dishes to celebrate the season with. Oh, how pretty, Michele! I love Easter colours and all the bunnies and chicks that come out this time of year! We can all be kids again, eh? Your tea things are so sweet! Thank you for joining me for tea, my friend. Wishing you and your loved ones a very Happy Easter. What a great Easter teaset! How cute! A perfect tablescape! I love it! And a very Happy Easter to oyu! This is such a darling tea set! My ganddaughters would be so charmed by it. So sweet! Michele, that is the sweetest little tea set! 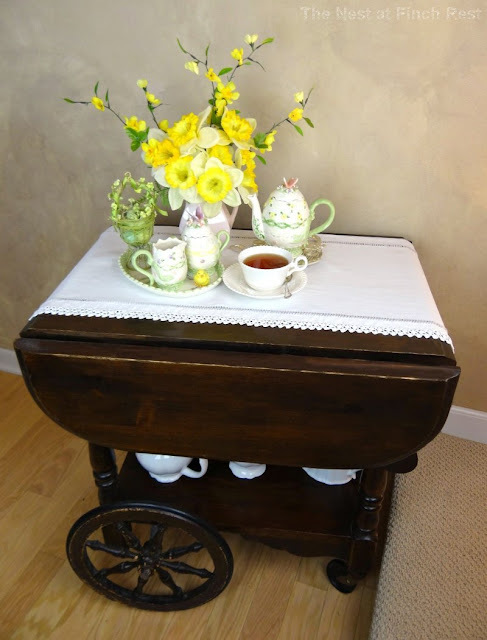 Your wooden teacart is a vintage treasure and the perfect place for an Easter tea. Now that is a perfect Easter tea set! The colors are just right for it too. Too cute! 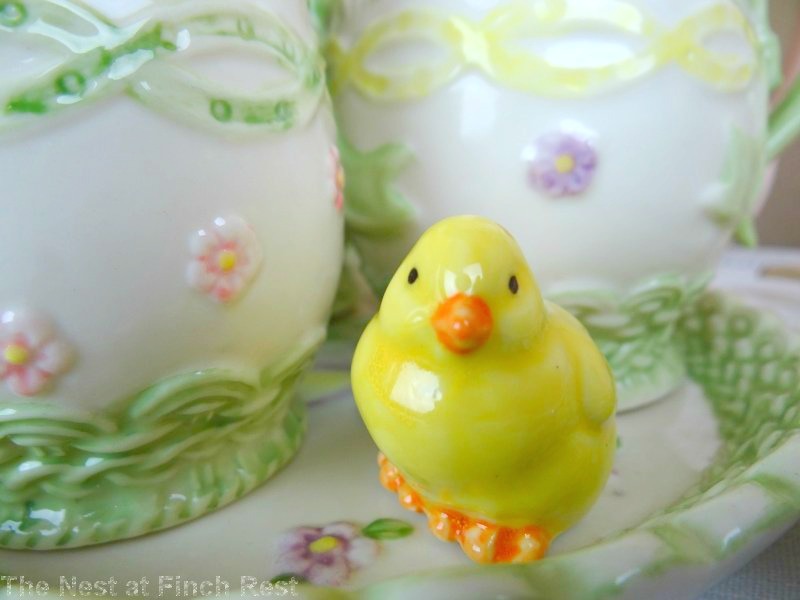 I love the tea set, the butterflies, the egg shaped plate and the little chick is just too wonderful! Happy Tea Day! I love your teaset and your flowers are so springy! Happy Easter! What a lovely tea set for one! I love your tea cart, too, Michele. I have my Mom's tea wagon that she bought when I was in second grade. She used to put pretty teacups on it. I need to do some vignettes on it and show you what it looks like. What a beautiful tea set! It really looks lovely set on your tea cart. It makes a sweet vignette. Love this cute tea. And perfect on your teacart which I ADORE! That tea set is just beautiful! What lovely colors, so pretty! 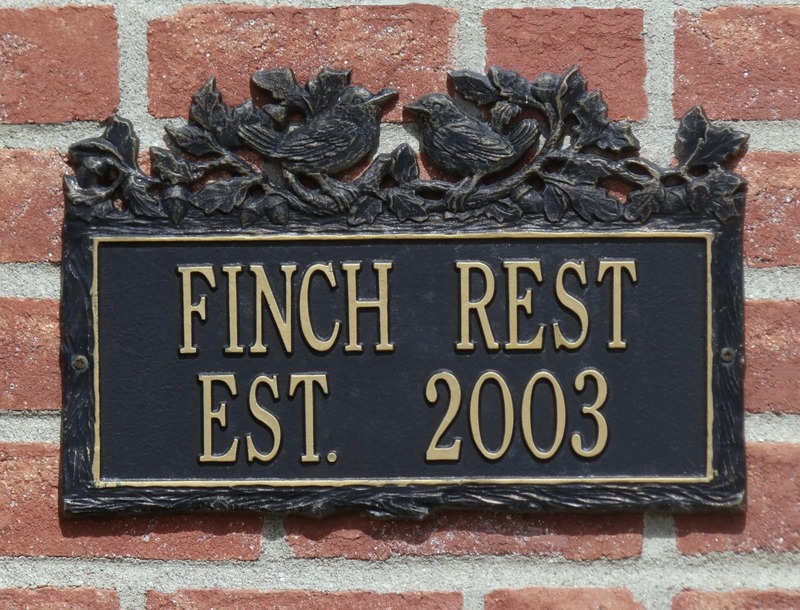 Thanks for linking up and linking back to Let's Dish! I have that same tea cart at home! What a a fun Easter Tea Post! I enjoyed my visit here!